REGISTRATION IS OPEN! Why attend? "It's such a stimulating environment to recharge your batteries every year." The AAP Experience: Physiatry '19 is unique in its focus on fostering meaningful and long lasting relationships between physicians, educators, thought leaders, trainees, and other professionals in physiatry within an intimate and collaborative environment. 96% of past attendees would recommend the AAP Annual Meeting to their colleagues! "The meeting is a treasure trove of resources for academicians in any stage of their career." Network, Network, Network! 83% of attendees come back to the AAP Annual Meeting year after year to connect with colleagues, share ideas, solve common issues and celebrate accomplishments. "Invest your time in going to meetings like the AAP. It not only provides you with education, it gives you a chance to meet other people who ultimately become collaborators." Education that Innovates: The AAP's Annual Meeting presenters are skilled trainers that will deliver education that innovates and creatively challenges the way residents, physicians and departments conduct research, diagnose and treat patients. New this year, our learning pathway will focus on the leading causes of disability globally (musculoskeletal disorders). "Everyone is willing to share information so you don't have to reinvent the wheel in your own program." Industry Trends: The AAP's Exhibit Hall gathers leading organizations that are improving patient care through innovative products, services and education. The AAP encourages engagement and collaboration with industry partners to achieve the common goal of improving the lives of physiatric patients. "A great effort to advance the field forward." Explore the full #Physiatry19 schedule! 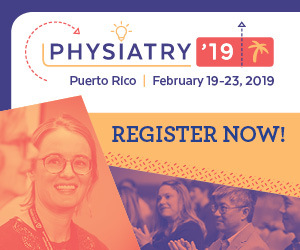 The Physiatry '19 event website makes it easy for you to plan your experience. Browse sessions and speaker profiles, book your hotel and much more. In Puerto Rico, rich history and culture combine to create a city with tropical influences and fun around every corner. It's easy to see why Puerto Rico is one of the most popular destinations in the Caribbean. Top attractions include OldSan Juan, El Yunque Rainforest and El Morro Fort. Puerto Rico is also a US Territory, meaning no passport is necessary when traveling. The AAP's Annual Meeting & Expo is the premier event for academic physiatrists, offering the opportunity to showcase your products and services, gain awareness and loyalty, and meet face-to-face with physical medicine and rehabilitation (PM&R) professionals. Sponsorship, exhibitor and advertising opportunities are all at your fingertips. In order to fulfill our institution's mission and better serve our patients, we need to continuously learn and develop our skills as physiatrists and academic leaders. But, finding the time and money for professional development can be difficult. Use this toolkit to justify the expense to your institution, whether it comes in the form of paid time off or financial support for your attendance. International attendees may need a letter of “invitation” in order to obtain a Visa to visit the United States. We strongly advise to start the visa application process as early as possible. Kindly note: The event organizers (AAP) will not be able to contact or intervene with Embassy or Consulate offices on your behalf.